Hop on a fun-filled, action-packed adventure! The 2 day, 1 night Cool Dingo Guided Tour Fraser Island gives guests the opportunity to explore the beautiful Fraser Island, on this fully guided tour, perfect for friends, couples and the young at heart. With comfortable accommodation at the Wilderness Lodge and delicious meals provided throughout the trip, guests get to experience an amazing 4WD sand island adventure whilst being able to sit back, relax and enjoy the ride. This trip is ALL INCLUSIVE! Joining a guided tour will give you a chance to enjoy the island as you are driven around from place to place. Our comfortable vehicles offer a place of relaxation as you make your way from one amazing designation to the next, where everything is taken care of for you! You will stop at all of Fraser Island's most sought after stops, getting to take in the beauty of the island first hand. This is a great option if you prefer a group tour with a driver, where all guests are accommodated in our Cool Dingo 4WD Bus! During your night with us, you will stay at our Wilderness Lodge, located north-east of Kingfisher Bay's main complex. Immersed in nature, our lodge is a perfect escape for an amazing night's sleep. We will provide everything you will need, including linens, blankets and towels, as well as hot showers and insect screened rooms! Lodges are also equipped with fans for hot summer nights and heaters for the cooler winter evenings for maximum comfort. We have a great lounge area for hanging out, as well as a kitchenette with coffee and tea to make your stay even more enjoyable. You can choose from a twin or double share or a dorm style room, depending on how you're travelling! Lake McKenzie - Fraser Island's best lake! You will be whisked away by your passionate expert driver and guide arriving at Kingfisher Bay by ferry at 9am. Here, you will then begin your 4WD adventure through sand tracks whilst being entertained by your guides fascinating facts on the history of the Island and flora and fauna in some of the more beautiful and natural spots. First stop is Basin Lake where you can marvel at the beautiful freshwater dune lake, enjoy a swim and may even be lucky enough to come up close to one of the resident turtles! Next stop is Central Station and Wangoollba Creek for a walk around the lush green ancient tropical rainforest, nature at its very best! Then along to Pile Valley and finally to famous Lake McKenzie where you can relax on the gorgeous white sandy beaches or have a relaxing swim in its crystal clear waters before heading to Wilderness Lodge where you will enjoy a delicious buffet dinner, and perhaps some socializing in the popular Dingo bar with your new found friends. An early start and you're headed down the best beach highway you can imagine! Enjoy the scenic drive down Seventy Five Mile beach before stopping at the turquoise waters of Eli Creek. Here you can enjoy floating down this fast-flowing freshwater creek on tubes that will bring along for the ride making an awesome pitstop to begin your day. Next stop is the Iconic Maheno Shipwreck which is one of the Islands most popular stops. 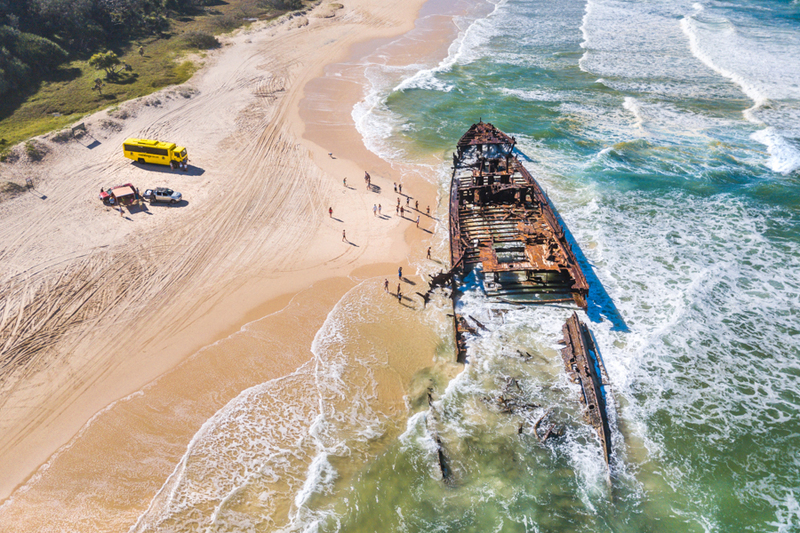 Awash since 1935, enjoy the history of the wreck from your experienced driver. Next is the Pinnacles Coloured Sands where you can photograph the immense rugged sand-cliffs, not that you'd forget them easily! Onward and upward to Indian Head, this amazing rocky headland lookout is great for spotting rays, sharks and even migrating Humpback Whales (Jul-Nov). Finally, unwind in the bubbling waters of Champagne Pools before returning to Wilderness Lodge late that afternoon where you can enjoy the resort before dinner and departure back to Hervey Bay. *Please note pick-up/return times, and sites visited are dependent on time constraints, weather and tidal conditions. Each guest may check in free of charge up to two items of luggage with a maximum weight of 25 kilograms (55 pounds) each. Additional items checked in will incur a charge. *Please note that this tour does pick-ups in Hervey Bay and Rainbow Beach, but only returns to Hervey Bay. It does not drop back off in Rainbow Beach. This tour may not be suitable if you have existing neck or back problems or are pregnant. Check with your agent to make sure this tour is suitable for you. Please note this tour may not be suitable if you have existing neck or back problems or are pregnant. Check with your agent to make sure this tour is suitable for you. Destinations may vary due to weather conditions, however our experienced drivers will always visit the best locations available under the prevailing conditions ensuring every trip is a memorable one.All departures and itineraries are subject to weather. Tours may be changed or cancelled for any reason at the discretion of the Tour Operator. It should be noted that adventure travel involves risk. Whilst we make every effort to safeguard clients, we cannot be responsible for personal injury or loss due to actions of our clients which are beyond our control. We recommend that all clients have travel insurance covering illness, injury, loss or damage to personal belongings and not being able to travel on the confirmed date of departure. Please be aware operators pass on credit card merchant fees so there is a non-refundable 2.5% surcharge for VISA, MASTERCARD and AMEX card purchases. 18-40's only, please enquire for suitable tours for other age groups. Thank you for booking with Mr Travel. If you would like any advice or assistance in arranging accommodation, transfers or additional tours, please do not hesitate to contact us. "2 days 1 night was perfect! Scotti was the best tour guide!!! Funny but professional! Everybody loved him."